Creaking Sounds and Deep Floor Scratches Begone! Laminate or wood flooring will often cost you a small fortune to install, especially if you own a sizable property. But in case you've pulled a chair a bit too hard or dropped a heavy refrigerator on top, don't be quick to spend heaps of money on a restoration project. 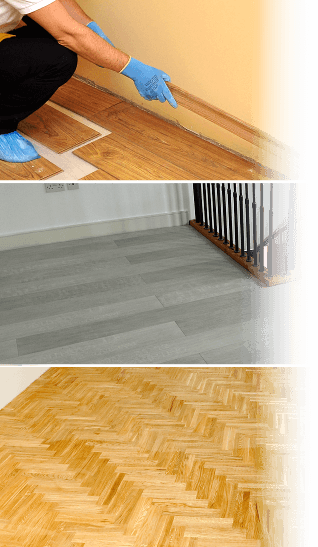 With Fantastic Handyman, you can get a speedy and reliable wooden floor repair service that is designed around your individual floor and the damage it has sustained. And all of this will come at a fairly budget-friendly price, too! Fill in surface cracks to repair floor tiles. Q: Why should I hire a professional to fix the flooring for me? A: If you tuck up your sleeves and do the flooring repair yourself, it's very easy to hammer the nails and tacks in all the wrong places, apply too much adhesive, or replace the floorboards incorrectly. In either case, you will restrict your flooring's movement, which will lead to all sorts of expensive problems in the future. A qualified specialist will know how to restore your flooring’s appeal without any of these hassles. Q: I recently dropped a bulky item on my hardwood floor. Will you be able to repair the damage? A: The knowledgeable London team will be happy to assist you with quality hardwood or other type of floor repair, as long as the surface is merely chipped or slightly scratched. To mask such unsightly marks as elegantly as possible, the pros will either use suitable filler products or apply the right amount of putty. Q: Should I hire laminate flooring repair if I have loose planks or uneven laminate? A: Absolutely! However, if the damage is too severe, the handymen will have to replace the individual plank or the entire affected floorboard segment instead. When repairing laminate flooring, the experts will also need to know whether it's glued on or snapped together so that they could neatly replace your damaged planks with ones of identical size and hue. Q: Can you inspect my wooden floor for defects? A: Yes, the diligent team can inspect all boards in your home or office to determine whether any of them are warped, uneven, or simply worn out. If some are damaged beyond repair, the friendly handymen will shop for a set of new materials that will best fit your stylistic preferences and budget. Q: What will my fixing a floor session include? A: Depending on your flooring's current condition, your session may involve anything from wood floor staining, sanding, and gap filling, to professional floor tiles, concrete, or hardwood repair. The seasoned pros will work fast, follow all safety procedures, and keep your place as clean as they initially found it. Q: Will I need to provide the experts with any materials? A: The handymen will bring along a range of tools and materials to complete any small domestic tasks. However, if your flooring project requires special materials, you will need to purchase those upfront and prepare them for the experts’ arrival. In case you cannot do this on your own or the items are hard to come by, the reliable specialists will readily supply them for you on the day of your appointment.